As adults with grown-up amounts of patience and focus, meditation can be difficult enough. How can we expect our children to take on this ancient practice when it requires a definite amount of discipline and self-control? Meditation, like anything else, is a learned behavior. We can’t expect our kids to be experts right away, but with dedication, patience and an attitude of play, they will be little yogis in no time. 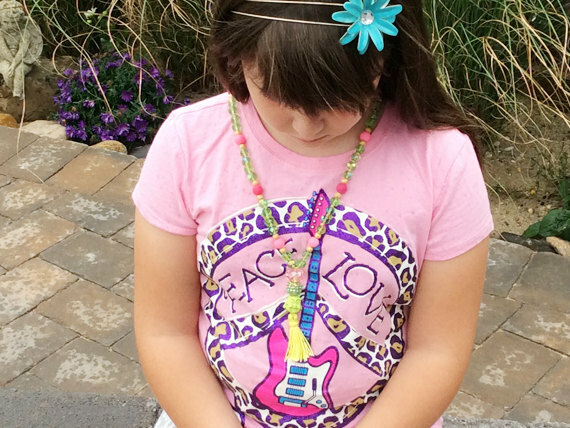 Malas are a great meditation tool for both children and adults. They have been used for generations upon generations as a way to manifest all your hopes and dreams. Traditionally malas have 108 beads – hold your mala in your hands and grasp the first bead after the guru bead (the largest at the bottom) between your thumb and middle finger see it here. Send your prayer or mantra out into the universe. Repeat for all 108 beads and you have completed your meditation for the day. 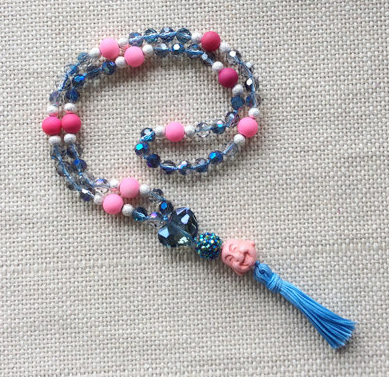 At Little Jay Malas we make half malas for children – 54 beads – the length is more manageable and meditation sessions require less of a time commitment. May All Children Have Love, Freedom and Happiness. This mantra is a great one to give your children a sense of the larger world. There are kids around the globe who don’t have these basic rights and sending them our love and wishes keeps us part of the global community. I Am Thankful For… Have your child name one thing they are thankful for and then have them repeat it as a mantra. By practicing expressing gratitude, grateful kids grow into grateful adults. Having gratitude reminds kids that they are loved and protected. Ask your child to create their own mantra. They should keep it simple and positive, but it could be anything from “I will ace my math test” to “I will play my best in my soccer game”. When you have completed your mantras for all 54 beads, you and your child should bring your hands to prayer at your heart’s center and say “namaste”. Namaste means that the divine spark in me recognizes the divine spark in you. Praise your child for making the time and commitment to meditate and plan for the next time you will take part in this practice. Be sure to store your mala in a safe and secure place.